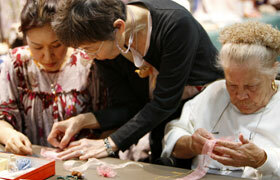 The Craft Fair was held for 2-days on Saturday, March 14 and Sunday, March 15. 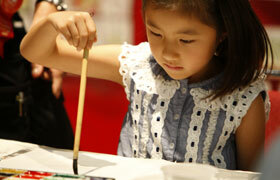 There were various traditional crafts from Hawaii and Japan. Also, there was a variety of vendor booths which the visitors were observing each of them and stopped at their favorite. The booth of Nihon Sports Fukiya Association was popular, where you can experience the Japanese blow gun called the fukiya. Mr. Joichi Saito, who is the chairman of the Hawaii branch said that the fukiya is popular sports among the workers in Japan and it is known to be very healthy. The members of the Hawaii branch are mostly elders however, the fukiya was enjoyed by a wide range of age group at the Craft Fair. Mr. Robert Banks from Canada was able to hit on 5 targets out of 10. He said “It was very fun! I want to challenge it again”, which he seemed to like it very much. 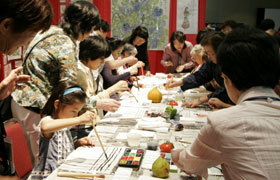 Also, there were booths run by the groups from Japan where the guests can experience the Japanese culture and arts. They include chigiri-e (torn paper), picture letter and Japanese calligraphy; Zōri making (sandals), traditional Japanese handball and Karuta (Japanese playing cards); origami (paper-folding). Those booths were popular which the seats were always full. The guests were participating in a serious manner. There were many who wanted to stay longer since the time was short. The exhibition of the Hawaiian quilt represented the Hawaiian culture. There were displays of Hawaiian quilts made by the students of Poakalani & Co. In addition, most of the displayed quilts were large. Mr. John Serrao, who is a well-known Hawaiian quilt designer said “Hawaiian quilt reflects feeling of the creator”. Then, he observed the Hawaiian quilt that was designed with the patterns of cherry blossom and explained “This was made by the Japanese living in Hawaii. You can feel how much she misses Japan through this quilt”. 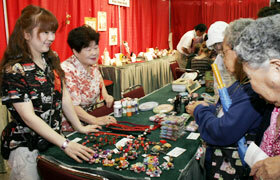 The Craft Fair is a place where people can understand and learn various cultures and traditional crafts. 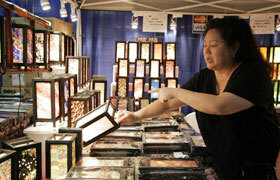 Each exhibitor introduced their proud culture and goods to the visitors from around the world. 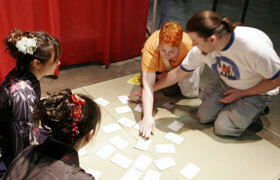 The guests were able to understand the rules of Karuta, even though it was their first time which was exciting. The members of Suginami Karuta Kai kindly taught the game. The picture letter was created using a brush. They young and old were passionate in creating it. The guests experience creating the traditional Japanese handball alongside with each other in a diverse, international environment. This is where the international exchange van be achieved. 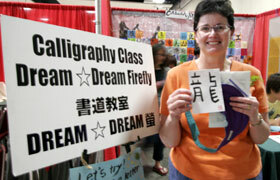 This woman from the U.S. mainland experienced the Japanese calligraphy for the first time, which she was able to write nicely. 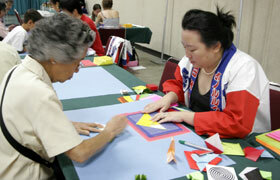 You can learn how to fold a box, crane, frog and so forth at the booth of origami. The picture letter is popular every year. The guest drew the picture by observing the fruits and vegetables. The Asian lanterns were being sold at the booth of Alohi Manao. Those colorful lanterns are popular in Hawaii. The ribbon leis were being sold. 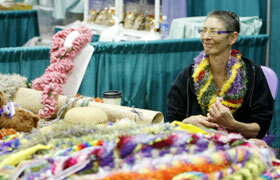 You can’t imagine that such beautiful leis are made with ribbons.